When I was a kid, my mom used to keep a small treasure chest of potentially-craftable items for our playtime. Toilet paper tubes, plastic milk jugs, and oddly-shaped containers from the most random of products were all fodder for that chest. For some reason, despite the fact that I played with them for about two weeks total, I distinctly remember crafting a half-pipe out of a milk container for my Tech Deck skateboards. 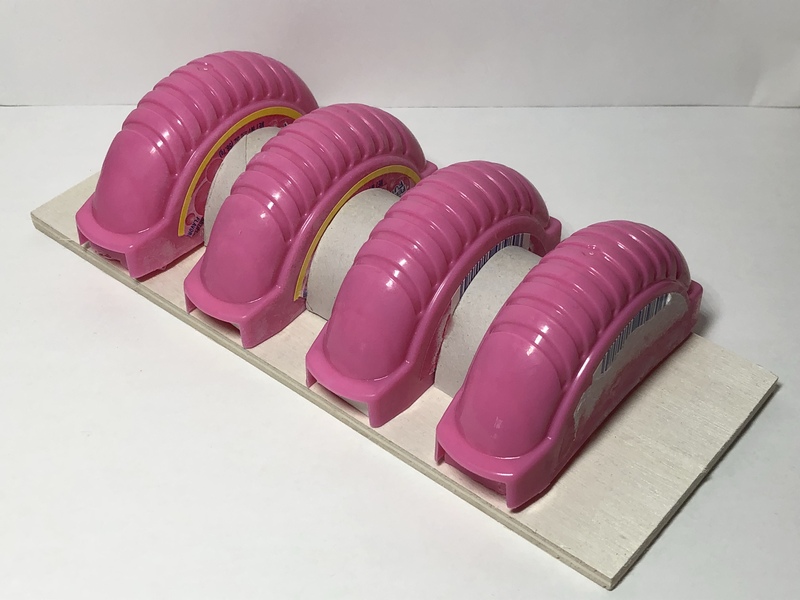 So a few months ago, when I saw one of the Legion Facebook group’s moderators, Matthew Stewart, post a really great photo of an imperial power generator using some Bubble Tape and a Tic Tac dispenser, I tucked it into the back of my mind as a great idea. 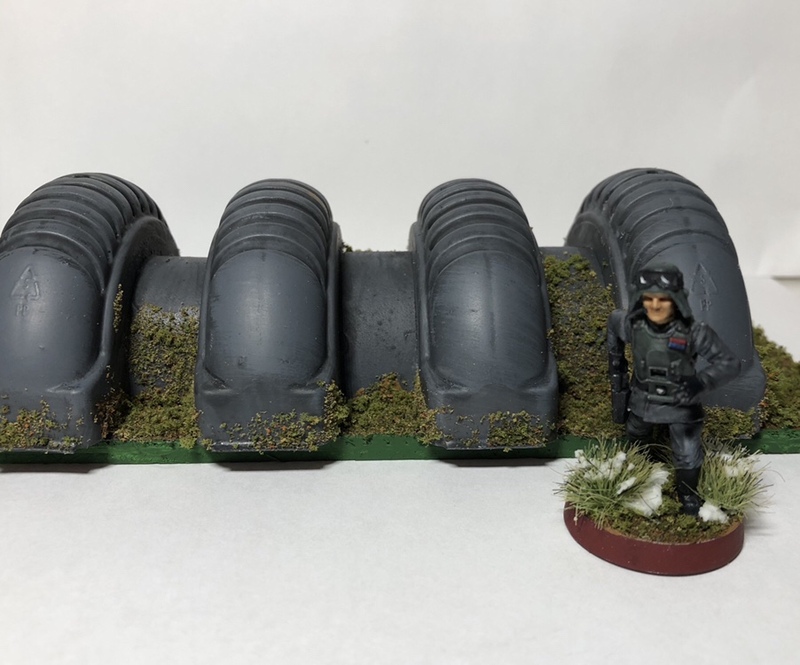 In this post I’m going to expand just a bit on that to create a dirt cheap – but entirely convincing – Imperial Shield Generator, straight out of Empire Strikes Back. To begin, use some scissors or wire cutters to cut the two Bubble Tape dispensers in half, shearing off (as much as possible) the protruding plastic on the top part. Next, take a standard cardboard toilet paper tube and cut it in half lengthwise. Then, cut three half-inch strips from the tube. In this photo you can just barely see that I used cut-off bits of index cards to fill the open gap on this end of the dispensers. Totally optional, but an easy fix if you so desire. Once all the glue has set, we’ll prime the whole thing grey. It doesn’t much matter what kind of grey, so just go with whatever you’ve got. Make sure to get it from all angles – there’s lots of weird bumps that could easily cause spotty coverage if you’re not careful. You might choose next to go over your entire generator in another coat of paint. I used Vallejo’s Neutral Grey to give a nice, even coat. But if you primed better than I did, you may not even need to do that. Next we’re going to very generously heap on some Nuln Oil over the whole generator, making especially sure to get it well into the divots on top of the dispenser halves. Don’t be afraid of going overboard on this, as we can always clean it up. I was pretty lose and fast with mine. I wanted it to look dirty and oily and weathered. We’re going for quick and cheap here, not perfect! Finally, we’ll turn our attention to the exposed bits of the base. You could easily do a quick and simple paint job on this and call it a day: all black, perhaps, or maybe a different shade of grey with a strip of hazard yellow around the edges. But if you’ve got the time and supplies on hand, a little bit of scenic texture can go a long way. Instead of Hoth, I decided to go for a bit more of an Endor look. I first laid down a thin foundation of Vallejo’s Earth Texture, washed the whole thing in Citadel’s green Athonian Camoshade, and then used a generic grass flocking on top. To go for the weathered, aged look, I also added some flocking on top of and on the sides of the generator, as if moss had grown up and over it. For a final touch, I painted the edge of the wood base a nice bright green color. And voila! You could throw some Aurebesh graffiti on there if you’d like, or find another way to dirty it up. But it already looks pretty great and adds a nice bit of Star Wars-themed scenery to your table. All told, the supplies for this cost me less than $5 (not including the scenic texture supplies, which I already owned). 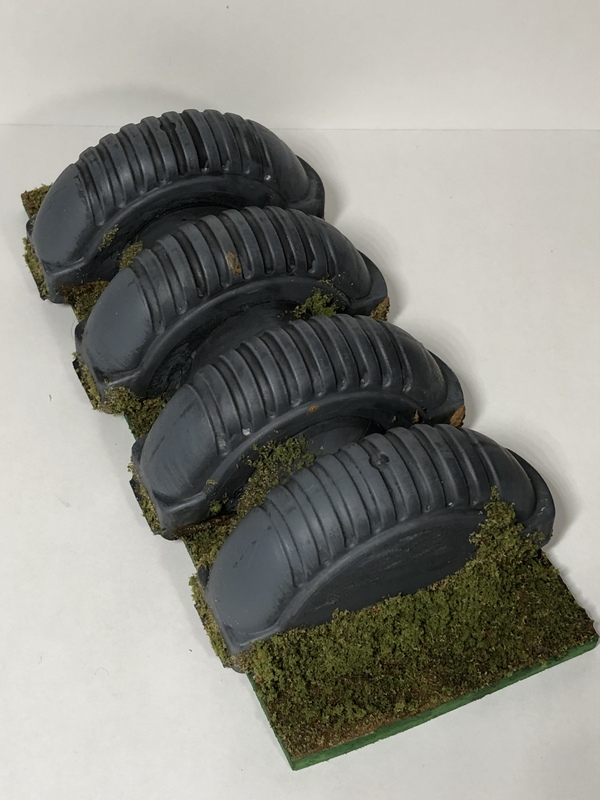 You could easily make a batch of four or five of these in a short amount of time to really fill in your scenery collection. I hope you enjoyed this tutorial, and as always if you do something like this yourself please send me a photo or post one in the comments!